Lately the themes for my Storytime-To-Go program have been repeats, and I didn't really do anything significantly different from the last time, so I didn't bother to write them up. But this time, while I didn't really use a novel theme, I did use a new assortment of books and activities. 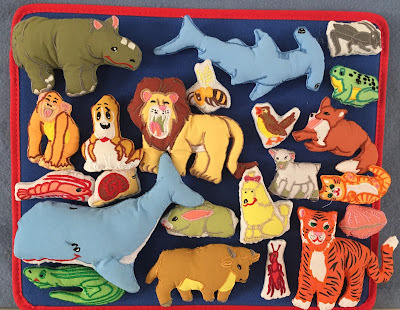 This was just a generic "Animal" theme, as a way to use an assortment of good books that had not been used in our previous, more specific themes, such as "Jungle Animals," "Zoo Animals," "Oceans," or "Farm". Each session is approximately 25 minutes (depending upon whether the class arrives on time! ), and I generally do 3 books and 1 or 2 songs/rhymes/activities with each one, but it does vary. I start each session by introducing the topic and the letter-of-the-day ("Aa"), then we sing our story song to help us settle down. I use a variety of books over the course of the two-week rotation. Hide & Seek by Il Sung Na, very charming illustrations, predict who is best at hiding. Ernest, the Moose Who Doesn't Fit by Catherine Raynor, funny, fold-out page. 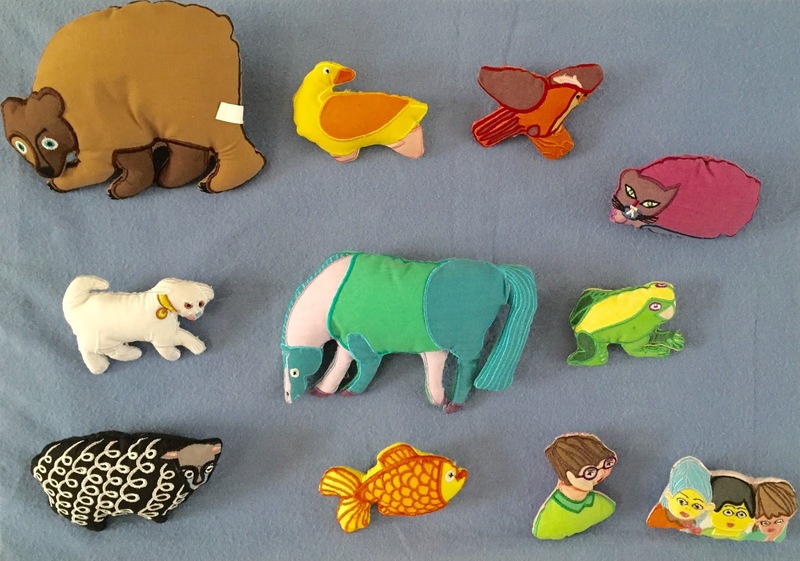 Animals Should Definitely Not Wear Clothing by Judi & Ron Barrett, very silly. Brown Bear, Brown Bear... by Bill Martin, Jr. & Eric Carle, a classic. From Head To Toe by Eric Carle, great to incorporate movement (but skip the donkey). Wild About Us! by Karen Beaumont & Janet Stevens, diversity & self-acceptance. Sitting In My Box by Dee Lillegard & Jon Agee, reading and imagination. 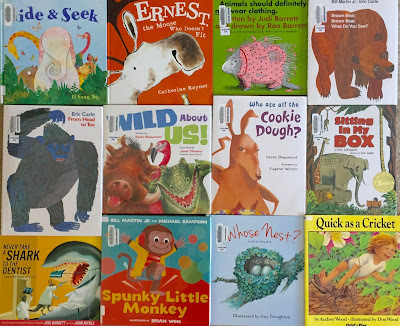 With this particular selection of books, we ended up incorporating a lot of activities with the stories, rather than as a separate activity. For example, both From Head To Toe and Spunky Little Monkey incorporate movement. Also, I had sets of flannel board pieces to go with both Brown Bear, Brown Bear and Quiet As A Cricket so I would hand out pieces to each child prior to reading the story, then when I got to the point in the story where their animal was mentioned, they would bring it up and place it on the board. They always love being able to participate in this way, and it was nice to have a different way of doing Brown Bear, Brown Bear since everyone knows it. 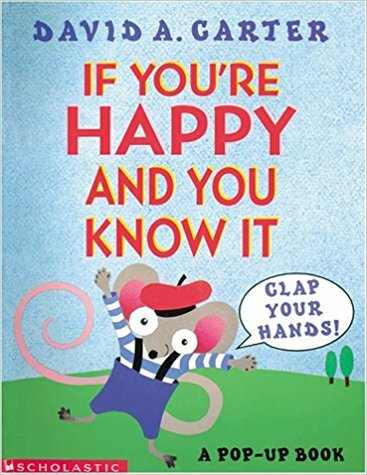 Another book that was used to incorporate an activity was David Carter's pop-up If You're Happy And You Know It, which features pop-up animal characters that illustrate the appropriate action for each verse when you pull the tabs, such as clap your hands, wag your tail, pat your head, and touch your toes. This book is really cute, and everyone seemed to really enjoy it, including the adults. I think everyone's favorite was the little dog wagging his tail. Then I also had some photographs of a number of different animals so they could see some realistic pictures of animals they might not be familiar with, like the armadillo, though I think they did end up knowing most of them. 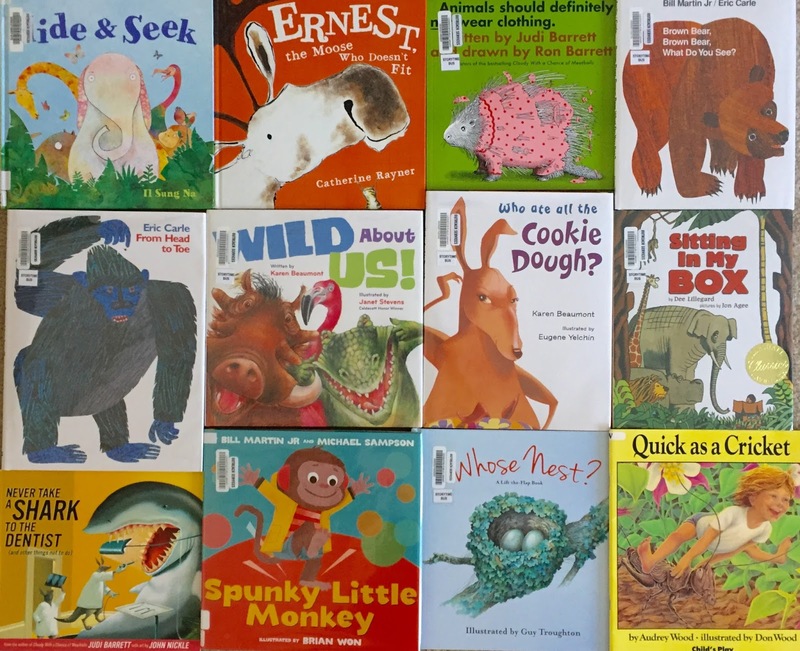 Though all the books worked fairly well, the ones they seemed to enjoy the most were Ernest, the Moose Who Doesn't Fit, Brown Bear, Brown Bear (no one ever seems to get tired of that), Who Ate All The Cookie Dough?, Wild About Us, and Animals Should Definitely Not Wear Clothing. They really enjoyed having the animals from the two stories to put on the board, and I really liked how it worked out that we didn't have add separate activities, because several of the books incorporated movement and song with them. The kids seemed to like this better as well. So, with my regular storytime falling on March 17th and being of Irish descent, I had to do a St. Patrick's Day-themed storytime. It took a little digging to find some suitable books, but luckily (and surprisingly) I found some at my small local library rather than where I work. 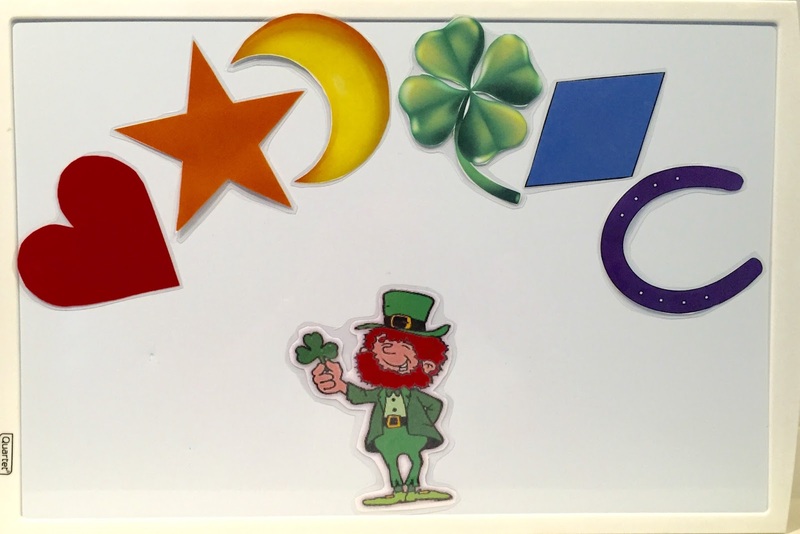 We started with our welcome song, then talked a little bit about how St. Patrick supposedly drove all the snakes out of Ireland, and some of the G-rated ways people celebrate St. Patrick's Day. They were already aware it was St. Patrick's Day and that people wear green. 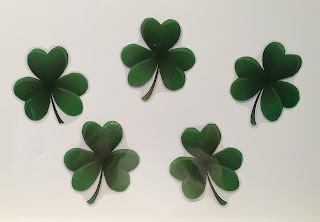 We also talked about clover/shamrocks, and how finding one with four leaves is supposed to be lucky. Then we sang our story song to get ready for our first book. The illustrations are bright and colorful, and the story has drama and humor, as well as an opportunity to talk about gardening, misunderstandings, and compromise. Five green shamrocks growing outdoors. Mother picked one, and that left four. 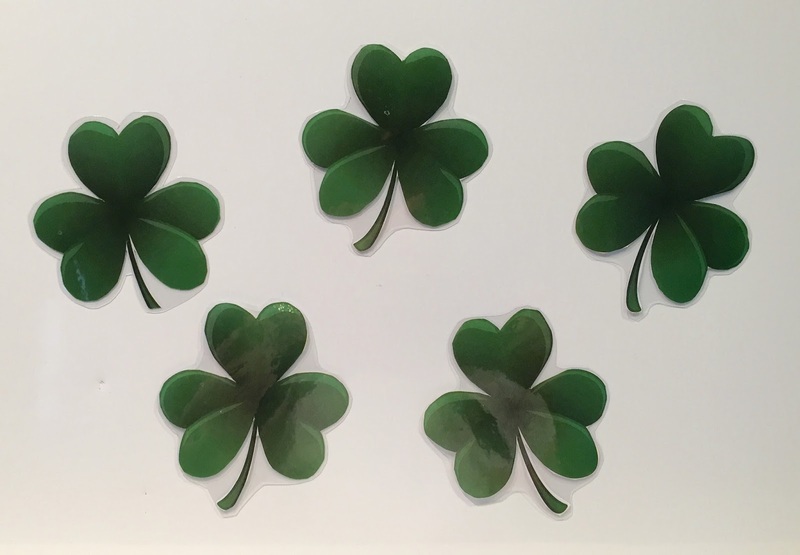 Four green shamrocks, green as they can be. Father picked one, and that left three. Three green shamrocks playing peek-a-boo. Sister picked one, and that left two. Two green shamrocks nodding in the sun. Brother picked one, and that left one. I picked it, and that left none! Our second book was a cute story by Leslie McGuirk called Lucky Tucker. 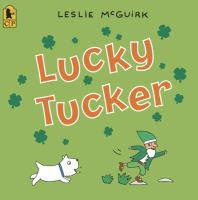 Tucker is a little white dog whose St. Patrick's Day is getting off to a bad start. He wonders if his luck will improve if he rolls in a bed of four-leafed clover. As he chases after the leprechaun who assures him his luck is about to change, he finds that indeed his luck has improved. This is a short simple story with brightly colored illustrations that are clear but not too detailed. 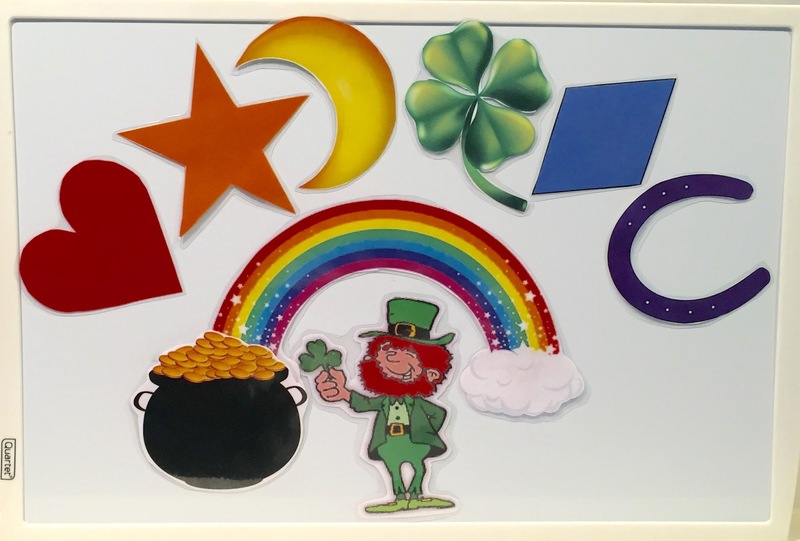 It introduces both the idea of four-leaf clovers being good luck, and the leprechaun, which many children may not be familiar with. 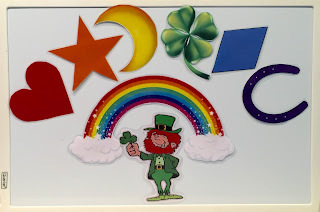 I followed this with a great flannel board from Jen In The Library inspired by one of my favorite childhood cereals, Lucky Charms, which she modified from Storytime ABC's version that was modeled after Martin and Carle's Brown Bear, Brown Bear, What Do You See? Leprechaun, leprechaun, what lucky charms have ye? Leprechaun, leprechuan, what lucky charms have ye? I have a purple horseshoe here with me. Children, children, what colors have we? Children, children, what do those make? The leprechaun's pot of gold! Clap your hands for me. Stomp, stomp......stomp your feet for me. Dance, dance.....dance a jig for me. Bow, bow.....bow like this for me. Sit, sit....sit down for our next story. 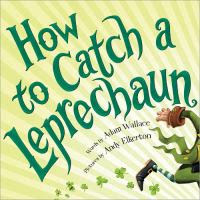 This made a great segue into our last book, How To Catch A Leprechaun by Adam Wallace and Andy Elkerton, which I led into by explaining the legend that if you catch a leprechaun he has to give you his gold, but that leprechauns are very hard to catch and like to play tricks on people. This book shows the leprechaun sneaking in and out of people's houses playing his tricks, and escaping all manner of traps. The traps start out simple and become more and more complicated, but the leprechaun still manages to escape. Perhaps you can design a better trap for next year? 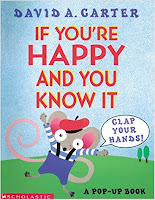 Cute and funny, with vibrant illustrations, and a 4-leaf clover hidden in the endpapers. After that we did our closing song and passed out stickers. 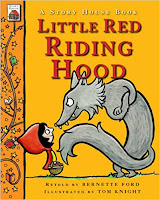 Being a good Irish lass, I was excited about doing this storytime, and felt like I had found some good books and some really cute songs and rhymes to complement them. However, I came down with the flu last week (despite getting a flu shot every year for the last 15 years! ), and while I am no longer contagious I have not yet fully recovered, so my execution was a little lack-luster due to the residual fatigue and dizziness. The kids still seemed to enjoy it, though. 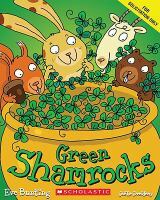 They really got into Green Shamrocks, with the drama of the missing shamrocks, and the silliness of the goat wearing the pot on his head. One little girl was so excited when the shamrocks started sprouting. Lucky Tucker didn't fair as well, though, as it did not hold their interest at all and there was a lot of talking and moving around. But they all settled down for How To Catch A Leprechaun, and really seemed to enjoy all the leprechaun's tricks. I've always loved Dr. Seuss, I think since I first saw the original animated version of How the Grinch Stole Christmas (I never get tired of seeing it, even though my kids always groan, roll their eyes, and complain when I recite all the words and sing the songs). I love the nonsense words, the imaginative creatures and contraptions, and the rhyme and rhythm; as an adult I appreciate the greater message in many of his works, too. 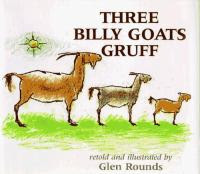 Given all that, you'd think I would have done a Dr. Seuss storytime before, but the reality is most of his books are too long for a preschool storytime, so I have only used one them before, and even then I skipped pages. 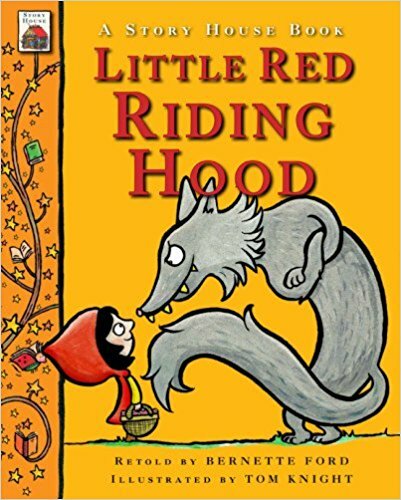 But, this year since my storytime fell just a day after his birthday, I decided it was time to give it a try, and I did manage to find some books that were either short and simple, or could be easily shortened. We started with an explanation of why I was wearing a giant red and white striped hat, which some did recognize as "the Cat's hat". I talked a little about Dr. Seuss and how he wrote many, many children's books that were full of silly words, strange creatures, and funny happenings, and that every year we celebrate reading during the week of his birthday, and mentioned some of the more well-known books and characters. Then we sang our welcome song and our story song. For our first book I read Marvin K. Mooney Will You Please Go Now! I chose this one not only because it was short and simple and I knew would be fun as a read aloud, but because it is not one of the more widely known Seuss books, which I wanted to avoid in case they had already read the better known ones at school, plus I wanted to introduce something new. This story has a lot of repetition that will have the kids join in telling Marvin to "Please go now! ", and laughing at all the funny ways the narrator suggests Marvin might go. eggs and ham, eggs and ham. here or there, here or there? Would you like them anywhere? here or there, here or there. You should try green eggs and ham. After that we read Would You Rather Be A Bullfrog?, which was illustrated by Roy McKie and published under a different pen name, Theo. LeSieg. For those who may not know, "Dr. Seuss" was the pen name Theodor Geisel used for books that he both wrote and illustrated. For the books that were illustrated by others, he used a different pen name, usually "Theo. LeSieg", which you might notice is his abbreviated first name with his last name spelled backwards! This book asks repeated questions about would you rather be this or that? Some are expected, like would you rather be a dog or a cat, but others are silly, like would you rather be a table or a chair? Kids will enjoy giving their opinions, though may have trouble explaining why. Both this book and the next one are easily shortened since each spread is independent as there is no overall story, and I did shorten both. I wasn't sure how these would go over with the younger kids I had, so I planned on skipping several of them for sure, and just playing it by ear. I introduced it by explaining what tongue-twisters are, and had them try a couple of the classics: "Peter Piper picked a peck of pickled peppers," and "She sells seashells by the seashore." Then I started with the longer ones in the book. I could tell the kids weren't really getting it, or at least didn't find it amusing, so I stopped after three. After this we sang a song I had intended to do as part of the introduction, but forgot (Oops!). When I first saw this song on Melissa's family blog, "Mel's Desk", it only had one verse, but I made up two additional verses in order to add more Seuss characters. 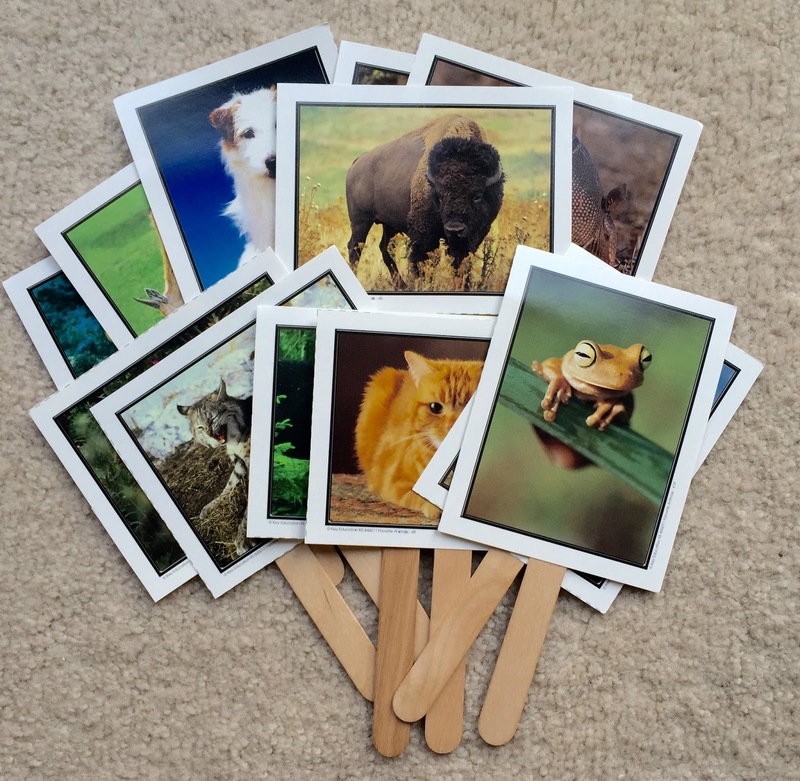 I printed out pictures of each character, laminated them, and put on popsicle sticks for visual aids. Prior to singing the song, we went through and identified each character. "Dr. Seuss Is On The Loose!" This is how we know it! Our last book, Because A Little Bug Went Ka-Choo! is probably one of the most often overlooked of Geisel's books because it was written under the pen name "Rosetta Stone". To my knowledge, this is the only book he published under that name. He collaberated with illustrator and friend Michael Frith, and the name was supposedly to honor Geisel's wife, who's maiden name was Stone. This is a great cause-and-effect story that starts simply with a little bug sneezing, which sets of an incredible chain of events leading up to total chaos! It will get a lot of laughs, but is also good exposure to the idea of cause-and-effect and consequences. This is one of my favorite Seuss stories, and one of the most overlooked (another is The Big Brag, which is also not very well-known). 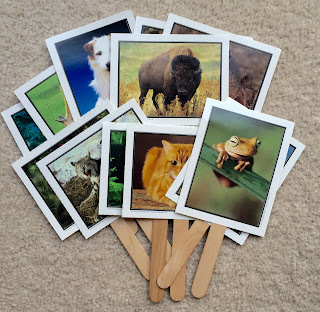 I had one last activity, also from Mel's Desk and Hummingbird Educational Resources, that features the most adorable props ever! 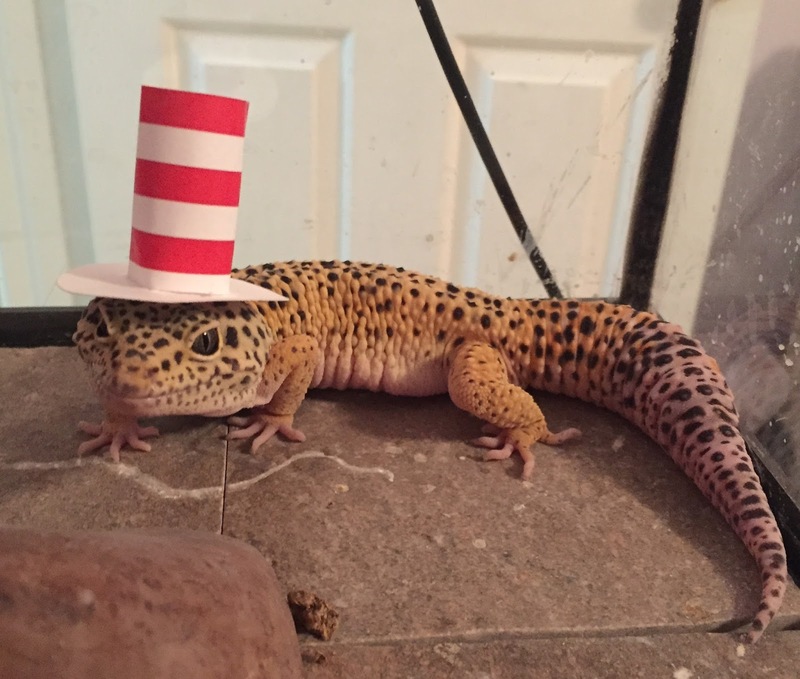 It is a fingerplay that is not specifically "Seussical", but is about cats putting on hats, with the hats being in the style of the Cat-in-the-Hat. put on their hats and then all ran away! I forgot to take step-by-step pictures to show the construction, but I found a printable stripe background at Vintage Digital Stamps (a scrapbooking site), and one page was more than enough for five hats. I simply cut short strips of the paper and used a glue stick to glue them into tubes that would easily fit any of my fingers. Then I used a punch (forgot to check the size, maybe 1"?) to cut circles out of card stock. I cut an "X" in the center of each with an exacto knife, bent the pieces up and glued to the inside of the striped tubes (Melissa has a photo showing this). I didn't realize until later that my hats have too many stripes. They should have 3 red stripes and 2 white stripes, but they looked too short that way to me, so you may want to look around for a background with slightly wider stripes. Then we did our closing song and passed out stickers, and I surprised them with a little something extra! My manager gave me a bunch of headband-style Cat-in-the-Hat hat's that she had leftover from a big program last year to give them ($1 for package of six at Target!). Everything went well and we had a lot of fun! They all started giggling as soon as I walked in with the big hat on, and asking me why I was wearing it. Most of them were familiar with at least some of Seuss's books or characters. They really liked Marvin K. Mooney and Because a Little Bug Went Ka-Choo!, and Would You Rather Be A Bullfrog was okay, too. Oh Say Can You Say didn't seem to interest or entertain them, so I didn't force it, but they did at least get an introduction to tongue twisters. I'm hoping to add a picture of them to this post because they were just so cute, but I'm still waiting for permission... In the meantime, here's one of me and my very own Cat-in-the-Hat, Toby!